Apparently not just humans who like to enjoy the baby cuteness. Animals monkey compatriots, such as mangabey and vervets, also has a similar habit. If there is one parent who gave birth to a baby monkey, then there is another parent-mother monkey will race to hold and enjoy the cuteness newly born baby it. The difference, though trade vervets mangabey and her babies. To participate cradling a baby mangabey and vervets, parent, other parent must pay the "price" of a particular, not be "free." Of course the pay is not money, only an obligation for the baby with the parent mempersolek stroked and smoothed its feathers. Behavioral findings were published online in the journal Animal Behavior recently. The researcher who discovered this behavior, Cécile Fruteau from Tilburg University, Netherlands, said that the obligation to stroking and smoothing the fur can vary long time. In his research, he revealed that several factors that affect the time to stroke is the number of infants in one group, the age of the baby and mother standing in the group. Fruteau describe, a mother monkey who has a newborn and is the only baby in the group can enjoy hair care for 10 minutes before finally letting the other monkey to touch her baby. However, when nearly 3-month-old baby, the parent will just get a hair treatment less than 4 minutes, even though her baby is the only one in the group. In addition, according to research Frateau, female monkeys from the low position in the monkey group had stroked and smoothed feathers longer than the monkeys that come from a higher position. Monkey will also be easier to let others touch the female monkey after liabilities are adequate, when compared with male monkeys. Behaviour of this kind was not only found in mangabey and vervets. Frateau explains, long-tailed monkeys also have similar behavior. Meanwhile, the spider monkey, a price to pay is not a mother caressing her baby, but hugged her. In marmosets, the parent who must mempersolek bayilah other females who caressed her baby. 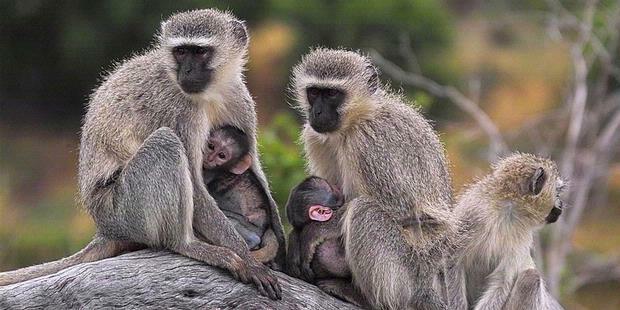 Frateau also said, mangabey and vervets who have a desire to touch the babies are female. Males do not interact with her children until the babies grow old.